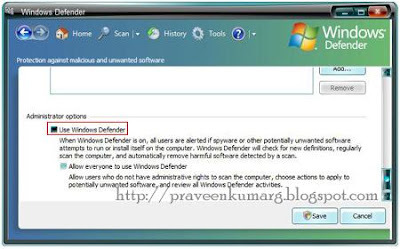 Windows Defender is an anti-spyware utility that built-in in Windws Vista to detect, prevent, remove and quarantine spywares.In Windows Vista Windows Defender is installed by default, many people are looking for ways to disable, uninstall or remove it from system as they prefer to use other anti spyware programs. If you’ve installed Windows Defender in Windows XP, you can simply uninstall it from Add or Remove Programs in Control Panel. But in Windows Vista, it is built-in and you can safely remove it from your hard drive. There are 2 methods to stop Windows Defender from auto starting when Windows is booted up. Scroll right to the bottom and you’ll see an option “Use Windows Defender”. Uncheck “Use Windows Defender” and it’ll be disabled. Look for Windows Defender name and double click to bring up the properties window. 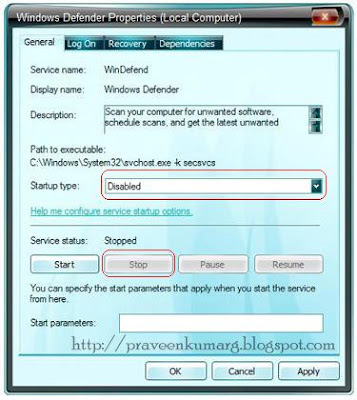 Click “Stop” button to stop Windows Defender services and set the Startup type “Disabled”. Go to Start –> Run and type msconfig. Go to Startup tab and uncheck Windows Defender displayed at Startup Item.